Everyone who knows me well can admit that I am very comfortable with online engagement. In fact, I love using it to make an impact on people (especially women) and tell them about how Jesus changed my life. With this blog, Facebook, and Twitter, I am able to share my life, what God is continuing to do with my heart and learning what your thoughts are on issues affecting the world today. It provides avenues to know how you are doing and what is on your mind. However, there is another social media website that I signed on several months ago and up this day, I have really mixed feelings about it. I initially signed up because I wanted to "mark" the "happysammy" user name. I am talking about Formspring. It's a website that allows you to create an online profile where people can ask questions (anonynously, if they prefer). Although I really love that I get to interact with good friends and get to ask them questions, I feel like the website enables narcissists -- which is something I personally feel we need less of in this world. I feel like having a profile on there shouts out to the world "I am interesting! Know more about me! I'm great and witty!" But I don't like being judgmental as well. I see great potential in this. 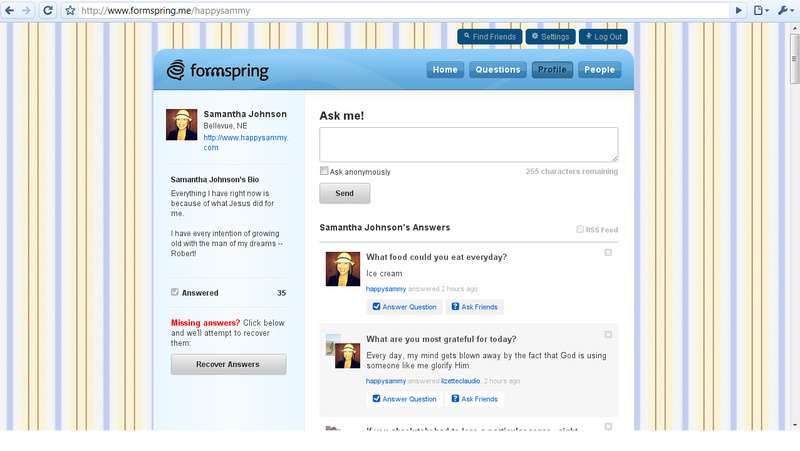 Can you imagine Steve Jobs or Seth Godin having a Formspring page that they answer personally? In an attempt to embrace this (and yes, reluctantly at this point), I am "officially" announcing my Formspring page. Yes, your questions are absolutely welcome. But more important than that, please help me change how I view it. Give me a different perspective. I am open!